by Zina Smith. This article first appeared on the Campbell Tickell Blog. 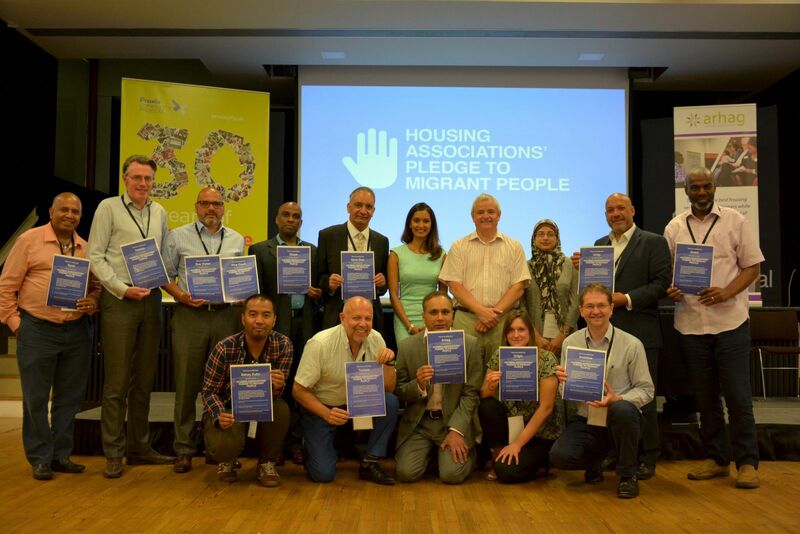 The first Migrants’ Access to Housing Conference took place on the 20th of June 2017. Zina Smith, CT’s Marketing and Communications Coordinator, reflects on the key messages. A divisive general election; terrorist attacks in Manchester and London; the Grenfell tower tragedy, and the start of Brexit negotiations; June 2017 was a difficult and painful month for many. People have been left heartbroken, angry and in need answers to the current state of our public services. Nonetheless, this period also demonstrated the resolve, resilience and charitable nature of the British public, who very quickly came together to donate their time, money and resources to help one another. Against this backdrop, the first Migrants’ Access to Housing Conference took place on the 20th of June 2017 with very timely messages on the need to cut through the politics of hate and change the narrative in the UK migrants today. 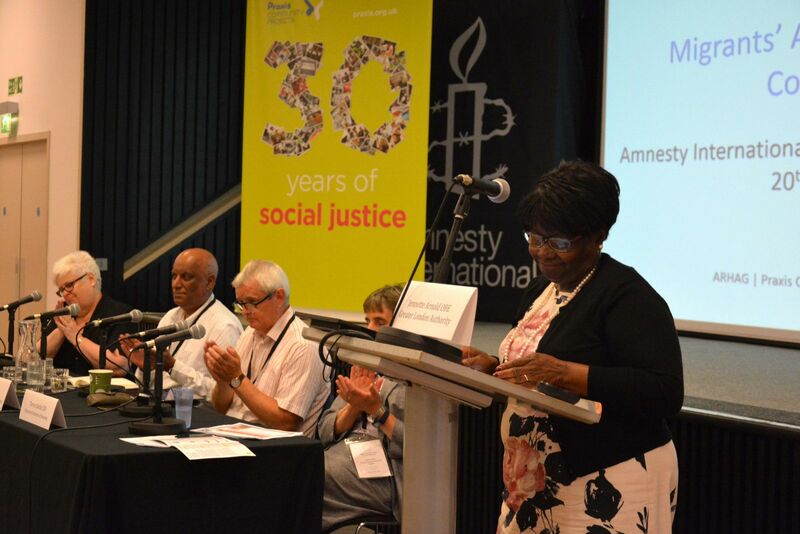 Organised by MigrationWork, ARHAG, Innisfree and Praxis Community Projects, the conference discussed the current challenges migrants face in accessing housing in the UK and the ways in which Housing Providers (HPs) and partner organisations can work together to ameliorate these. Raise awareness about the issue. So far eighteen social landlords have signed this pledge, and it is hoped that many more will follow. John Delahunty, Chief Executive of Innisfree, told Inside Housing magazine “The pledge doesn’t require the promise of a lot of resources; it does require the promise of our intent to do what we can to help”. The conference was split between an informative panel discussion in the morning, followed by workshops on specific issues in the afternoon. The morning panel discussion titled ‘Housing Migrants in Hard Times’, was opened by Jennette Arnold (OBE) (GLA), and chaired by Barbara Roche (Chair of Praxis), with panelists: Terrie Alafat (CEO, CIH), David Orr (CEO, NHF) and Dr. Nigel de Noronha (University of Warwick), setting the scene by discussing the contribution migrants make to British society and the challenges they face. Jennette spoke about the pervading myths surrounding migrant’s and social housing. Migration is a complex issue, as exemplified by the many classifications of who a ‘migrant’ is i.e: an EU migrant; a refugee; asylum seeker and non-EEA migrant, etc. Navigating the system with these different labels impacts on the experiences and entitlements of those individuals. Grenfell has brought social housing into sharp focus, and shockingly, resurfaced some of these well-hashed myths. The notion that many are ‘jumping the queue’ for housing is so prevalent that even where migrants had lost their lives, some were questioning whether they had the right to live there in first place! There’s no automatic entitlement to housing for anyone this country, let alone for migrants. Jennette concluded that we need to work hard to unwind this misinformation and move from a conversation of fear to one that celebrates migrant’s contributions to society. Terrie Alafat then spoke about the Brexit, EU migration and housing. The discussion found that EU migration has an insignificant effect on social housing, except in some areas where there are high numbers of EU nationals. Most EU migrants come to the UK to work, not to get benefits. Of the 3 million EU migrants in the UK, 2/3rds are working with contributions made in taxes far higher than any tax credits and child benefit they may receive. Indeed only 16% of EU nationals are in social housing, with the majority of all migrants who have arrived in the last five years living in the private rented sector (75%). Due to eligibility requirements for jobseeker’s allowance, many who arrive seeking work can easily fall through the gap. Indeed, 47% of rough sleepers in London are from the EU countries. (Figures from: CIH UK Housing Review 2017). Further, the current uncertainty surrounding the future status of EU citizens in the UK caused by Brexit may also have serious implications. With 8% of construction workers from EU countries, and higher in London, the capacity to build the houses needed may fall short if we cannot guarantee work permits. David Orr then passionately articulated the need to change the public narrative on migration. This can be achieved through leadership and challenging mainstream media by articulating a different language. This has been done before, for example the Sector demonstrated that the UK had a housing crisis by highlighting the lack of affordable homes and that homelessness is not an inevitability. Unfortunately, a language of ‘othering’ migrants, using terms such as “them” and “us”, vilifies many. We need to have leadership from the housing sector and beyond, that challenges this negative depiction and articulates a positive view of a future society that is inclusive of all. Lastly, Nigel de Noronha, outlined findings on of the ‘drivers of migrant and minority housing disadvantage’ based on a recent study carried out by Sue Lukes, Nigel de Noronha University of Warwick and Nissa Finney, University of St Andrews. Drivers of discrimination include: the legal/policy framework; the misapplication of this framework (rhetoric and discrimination); individual and institutional discrimination; lack or removal of regulatory, advocacy and advice services and support for migrant and minority organisations; changes to benefits and other provisions that support housing access e.g. benefit cap. Several case studies demonstrated, however, where local initiatives have challenged these drivers. For example, Glasgow City Council has been tackling criminal landlords, while in Bradford, programmes promoting intercultural dialogue between Asians, Eastern Europeans and Filipino residents on “shared neighbourhood and community concerns” are being run. Good practice is happening at the local level; this needs to be scaled up to the national level. The afternoon seminars focused on specific legal, social and political issues relating to migrants and housing. Adrian Berry, Barrister at Garden Court Chambers, discussed housing rights for migrants, focusing on three key legal landmarks: the Housing Act 1987; Right to rent and the Discrimination Act. Patrick Duce of Homeless Link and Sally Daghlian, Praxis Community Projects, discussed the context and complexities of destitute migrants, with examples of good practice in homeless relief. While Sue Lukes focused on ‘migrants as customers’ and how to work sensitively with this group, understanding who they are and what risks they may present. The final message of the conference? Organisations must show leadership in reinforcing positive stories about migrants through building positive marketing campaigns, as well as training their staff in how to sensitively navigate complex contexts (legal, political, cultural and social) within which migrants in the UK live. There is a lot of work to do but by working collectively, positive change can happen.